What Is the Standard Height of a Bathroom Vanity? For decades, standard bathroom vanity height was 30 to 32 inches, but this range may be less common today. Vanity comfort heights often replace traditional standard heights to accommodate a growing population since, in general, people are physically taller than their ancestors, but also to oblige modern sinks and cabinet styles. Don't be too quick to install a vanity at any height without first weighing a few pros and cons. A bathroom vanity that looks like furniture. Comfort-height bathroom vanities typically stand at kitchen counter height, about 36 inches high, but this isn't ideal for everyone. If it's easy to chop veggies or mix batter at a standard kitchen counter, it's also likely a good height for your vanity. If you're bending forward or lifting your elbows like a bird readying for flight to accommodate the kitchen counter on the other hand, a slightly higher or lower vanity may be in order. Consider that a tall vanity -- 42 or even 48 or so inches high -- can result in less bending while brushing your teeth or washing your face. Factor in every occupant's height and abilities, remembering that someone in a wheelchair has specific needs, and that children don't stay small. 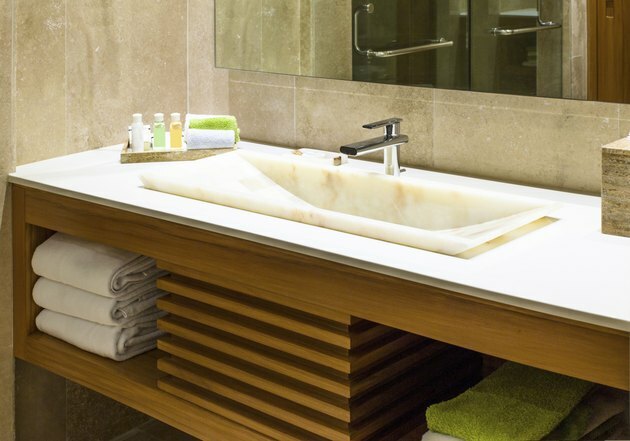 A raised basin or vessel sink calls for a lower vanity to bring its top edge or rim to a comfortable height. How far a particular sink's rim sits from the finished floor is what counts, so calculate the basin's installed height plus the vanity's height, if you aren't using an all-in-one unit. Conversely, an under-mount sink can mean even more bending since it sits from a couple to several inches lower than drop-in styles. Floating or wall-mounted vanities offer airiness, but if they're positioned too low they merely provide somewhere for dust bunnies to burrow. Choose a design that leaves enough space underneath without being too high or low for your comfort. For someone in a wheelchair, install a floating vanity at an appropriate height for knee space and easy access. The countertop typically adds 1/2 to 2 inches of height to the vanity, depending on the material. Countertop thickness is also aesthetically important: A thick stone slab, for example, appears more substantial than a thin one, but can perceptively squash a sleek vanity or slender-legged cabinet. If you have the skills, , or by changing its height -- add or remove risers or revamp the apron. As you mull over an appropriate vanity height, also consider how everything else relates to it, including mirror size and another not-so-standard standard: Traditional toilet height has grown from 17 to 19 inches, floor to seat.